I have been doing scientific and computational imaging for research and conservation documentation of the Smithsonian collections at the Museum Conservation Institute (MCI) for five years. I have a background in fine art photography and was trained on-site by a senior conservator turned imaging specialist in the specific techniques and applications within conservation. I use a range of techniques including multispectral and hyperspectral imaging, photogrammetry and 3D scanning, digital radiography and reflectance transformation imaging (RTI). In the autumn, I started a heritage science program for the Science & Engineering Arts Heritage & Archaeology (SEAHA). SEAHA is a Centre for Doctoral Training (CDT) funded by the Engineering & Physical Science Research Council (EPSRC) created by University College London, University of Brighton and University of Oxford. What’s you role at SEAHA and MCI? As a student I am researching the spectral and 3D imaging techniques for object documentation and the eventual integration of the techniques. As a digital imaging specialist, I am working with a range of scientific and computational imaging techniques to answer research and conservation questions about objects and collections coming from conservators, curators and researchers. 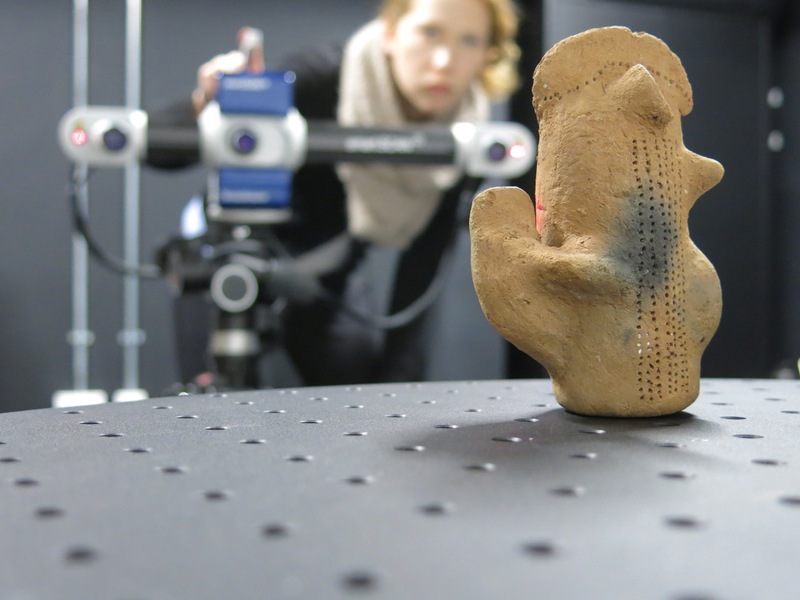 Keats Webb 3D scanning a test object (a ceramic figure from Senegal) as part of her research with the Cultural Informatics Research Group at the University of Brighton. Part of my research has involved a case study imaging collection items from the Freud Museum in London, UK. The Museum is Freud’s last residence where he moved in 1938 to flee from the Nazi’s in Austria. After Freud passed away in 1939, his daughter lived in the house for another forty years and the Museum opened in 1986. The collection is a combination of libraries, archives and about 2000 antiquities (Roman, Greek, Egyptian and Oriental). Freud was very interested in archaeology and antiquities and used archaeology as a metaphor for psychoanalysis. It was quite exciting to be working in Freud’s study and to be able to image a wide range of objects of different materials and origins. 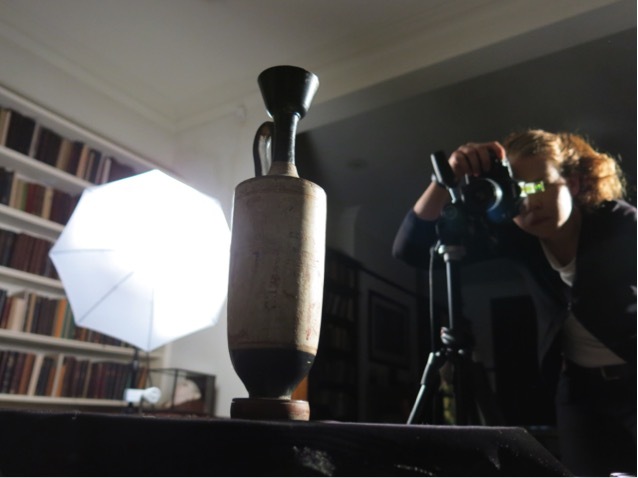 Keats imaging a white ground lekythos (#4492) at the Freud Museum. In 2009, I was taken on as an intern by MCI Senior Furniture Conservator, Melvin Wachowiak. Mel was a Senior Furniture Conservator turned imaging specialist with an enthusiasm and passion for conservation and new technologies. Mel was very generous with sharing his knowledge and expertise and he was dedicated to mentoring and training others. I had the privilege of having Mel as a mentor for nearly five years. He was very thoughtful and meticulous in his work, he valued collaboration, he was enthusiastic about the process and results, and he had a priority for accessible techniques that maintained innovation. Mel passed away in May 2014, but I still find him to be an inspiration for the work that I do and will continue to do. I absolutely love my work as an imaging specialist at MCI!! MCI does not have a collection, but supports the 19 Smithsonian museums and galleries in addition to the research facilities. This allows me to work with a range of collections and materials, which makes the work interesting and exciting. I have had the opportunity to work on paintings, mummies, musical instruments, fossils, just about anything you can imagine in a museum collection. As a student, I have had an incredible opportunity to expand my skill set and focus on my research abilities while working on different collections and making new contacts. I enjoy meeting other heritage professionals that are excited and interested about cultural heritage imaging, and the SEAHA program has allowed me to expand my network into the EU. The interdisciplinary nature of the field and the ability to use science to learn more about our heritage makes heritage science really exciting and great!